Building a great web site takes work, whether you love to code or don't know the first thing about it. Several tools attempt to help you solve that problem, but no one option fits the needs of everybody. Here, we're going to look at the best popular approaches so you can find the one that suits you best. I've built many web sites in my day, and recently I put together several more. In doing so, I found that each project worked best from a certain approach. Some sites made sense to code from scratch, whereas others benefitted significantly from using a content management system like WordPress. Needs vary from site to site, so sticking with the same tools every time isn't necessarily the best way to go. You have to figure out your needs and goals in order to choose the most efficient and powerful tool for the job. In this post, we'll take a look at a handful of popular options, their pros and cons, and why you would pick them to build your web site. 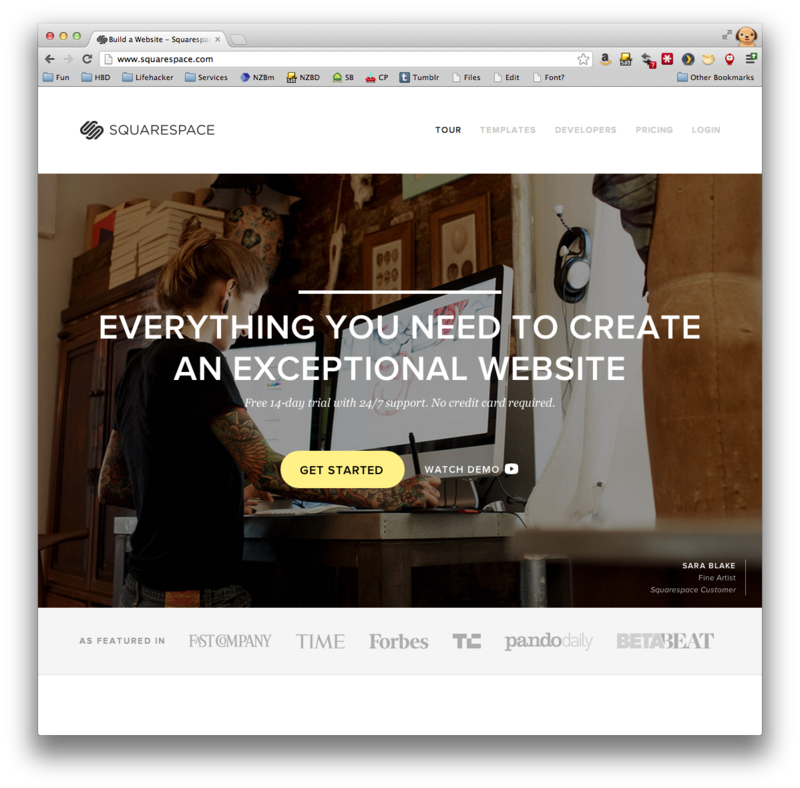 When it comes to ease of use, Squarespace comes in first. Sites are incredibly simple to build, and they start you off with some very nice templates. The templates are customizable, even if you don't know how to code, and they're minimalistic enough that a few minor changes make them look unique to you. Seasoned coders, on the other hand, get an even larger amount of flexibility. Either way, the service offers a great platform for building sites quickly and a cloud-based approach that keeps your site online regardless of any traffic spikes. While Squarespace came with significant limitations when it started out, the service recently grew into an ideal tool for creating a blog or web site. Anyone can use it, and it'll teach you how it works the first time you sign in. Squarespace offers so many beautiful templates to start from that you'll have a difficult time making a choice. This is a very different experience from something like WordPress, where the hard part is choosing a template you actually like from a pool of thousands. After choosing a basic design, Squarespace offers visual editing tools that offer instant, live feedback so anyone can customize it to their liking. People comfortable with code can jump in and make edits to the CSS as well. On top of great design and editing features, the platform makes it incredibly easy to not only add page content. Whether you're posting in your blog, making a static page, or adding a photo gallery, you can do it with little effort and expect beautiful results. If you want to accept comments to a blog post, you just turn them on. Users log in using their existing Twitter or Facebook accounts, or you can integrate the popular internet-wide commenting system Disqus. Integrating social media just takes a few clicks, statistics are thorough and beautiful, and you can even manage your site with a mobile app. In past years I found Squarespace too limited, but the latest version (6) is thoroughly impressive. Squarespace may offer a stellar platform, but that comes at a cost. When you're trying to build a small site, every other option we'll look at here will cost you less money. Building a site with Squarespace will cost you $8 a month if you prepay for a year. That's no more than a Netflix membership, and something most everyone can afford, but if you're planning on building multiple sites the costs can add up fast. Additionally, you get a limited feature set by choosing the cheaper plan. If you want all Squarespace can offer, you'll pay $16 month (when billed annually). That's a hefty price tag for a single site if you aren't drawing loads and loads of visitors every day. Even setting price aside, Squarespace only makes good sense for your site if your site requires a number of pages or you want to start a blog. 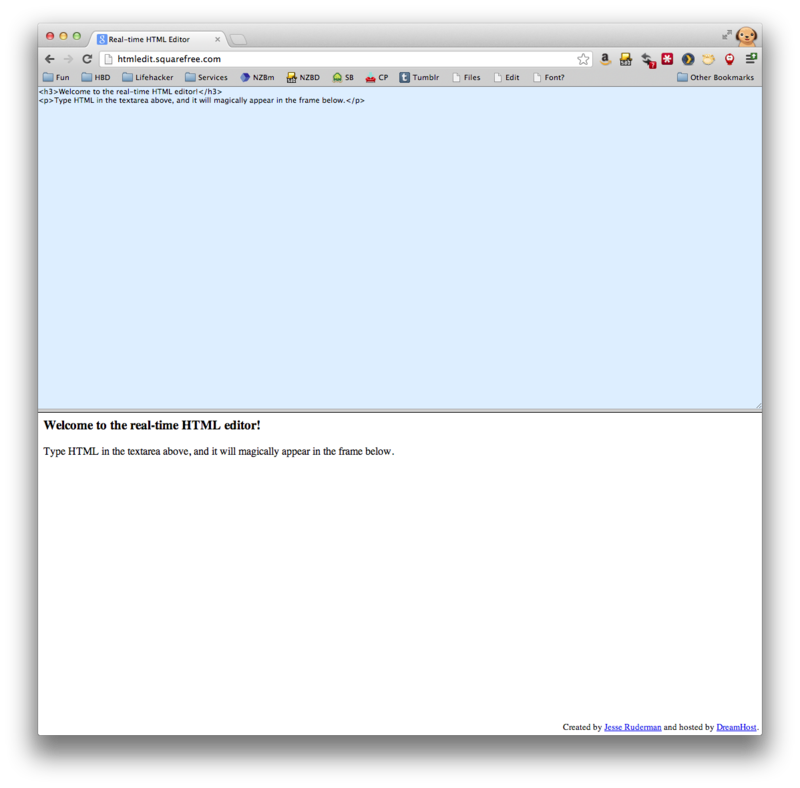 It's essentially wasteful to use such a powerful platform for a tiny site. That waste becomes even greater when you factor in how much you're paying for the service. The same could be said for other content management systems (CMS)—software to help you manage site content—like WordPress, but those often come without a monthly bill. While Squarespace put together a phenomenal platform, it doesn't make sense for everyone. If you want to create a medium or large web site, never worry about traffic spikes, and spend very little time putting it together, Squarespace is the way to go—assuming you can afford it. If you're creating something smaller, however, and don't intend to draw a high volume of visitors, another solution will suit you better. WordPress has long been the content management system (CMS) of choice for many bloggers and web site creators for years. Despite its fairly old age (nine years), it still holds up as an incredibly powerful and versatile platform. You can do a lot even if you don't know how to code, but if you do the possibilities are enormous. WordPress is an open source project with an enormous user base and developer community. Not only is the platform easy to use from a site creation standpoint, but if there's something it can't do out of the box you'll likely find a plug-in (or twenty) that solves the problem in a few clicks. You'll also have access to massive selection of site templates (called themes). Some templates cost money, but many are available for free. WordPress provides many options for just about every possibility you can think of, and if you know how to code you can create of custom plug-ins and themes for yourself. In fact, we have a guide on how to do that. Thanks to WordPress' open source status, you also get to choose whether you want to install the software on your own server or sign up for a hosted version at WordPress.com. You don't have to pay for hosted WordPress, but you lose out on a lot of features if you don't. For $100 per year (about $8.33 per month), which is about the same price as a basic Squarespace account, you get everything (including a custom domain name). Although WordPress is highly customizable, you'll still need to know how to code to have full control over the design. Even with a comprehensive tutorial, you'll still need to learn the basics of coding in order to put together your own theme. Additionally, the massive number of plug-ins and pre-existing themes gets a little daunting. With so many options, you'll have trouble sorting through them all to find exactly what you're looking for. WordPress tries to alleviate this problem with a ratings system, but that doesn't mean a good plug-in has the exact feature set you want. Additionally, many plug-ins and themes become outdated as WordPress updates often and can cause compatibility issues. If you know how to code and don't mind spending the time searching, these problems won't bother you too much. Because WordPress is so popular it's often a target for spammers and hackers, too. Years ago, WordPress security was a serious issue. If you keep your installation updated regularly, however, you don't have as much to worry about. Spam comments, on the other hand, are frequent. This is a little annoying, but built-in plug-ins like Akismet can help alleviate the stress of removing spam. WordPress has long been a solid choice for web sites and blogs. It offers more options and more customizability than any other platform, but you may miss out on some of that if you don't have any coding skills. 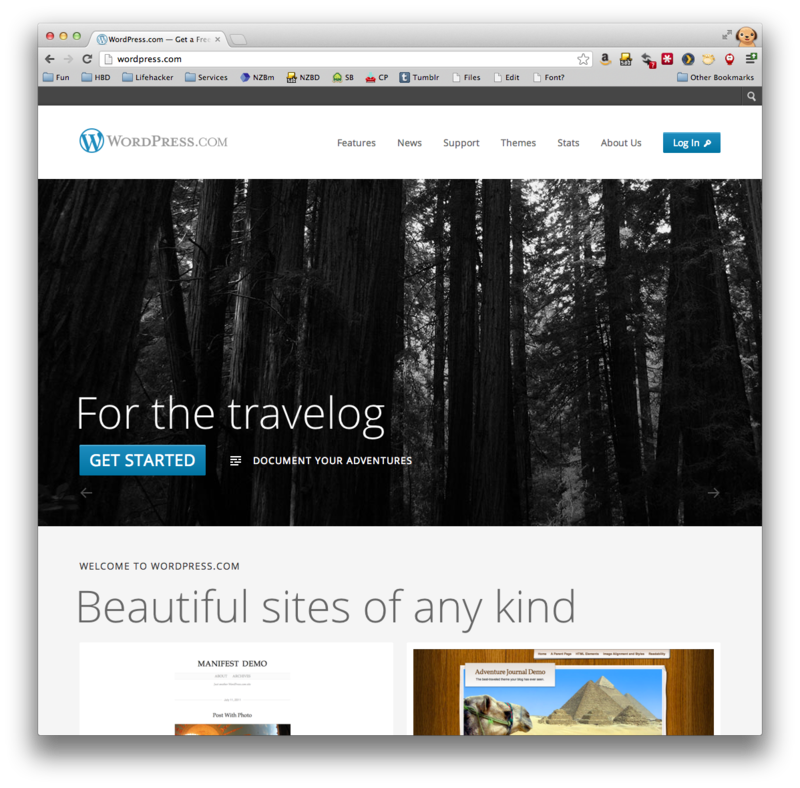 When comparing WordPress to Squarespace, as many often do, think of WordPress like Windows and Squarespace like OS X: WordPress offers more options but Squarespace offers simpler, more seamless experience. Both are great choices that suit larger sites better, but you can use WordPress for free whether you have a your own web host or need them to host your site. Tumblr is a microblogging platform, which means it was designed for to host a lot of little short posts. Nevertheless, you can use it to create a web site. Your options are limited, but you don't have to code and you gain the benefits of joining large, thriving community. Tumblr offers a very simple way to get your content online fast. All you do is sign up, pick a template, and start posting. Your posts show up on your site (yourusername.tumblr.com by default, and you can assign a custom domain), but other Tumblr users can reblog them easily. This makes it possible for your content to reach more people with virtually no effort on your part. Tumblr users who subscribe to you will see all the new things you post, and non-Tumblr users can grab an auto-generated RSS feed to get updates through their newsreader application. If you want more than a (micro)blog, Tumblr also allows the creation of static pages. Anything you create with the service will remain blog-oriented, but you can create a simple site for free with a great, built-in community. Although you can create a site with Tumblr, your options are limited. The service wasn't created for complex web pages, and any serious customization either requires a knowledge of CSS and HTML (for template editing purposes) or simply isn't possible. 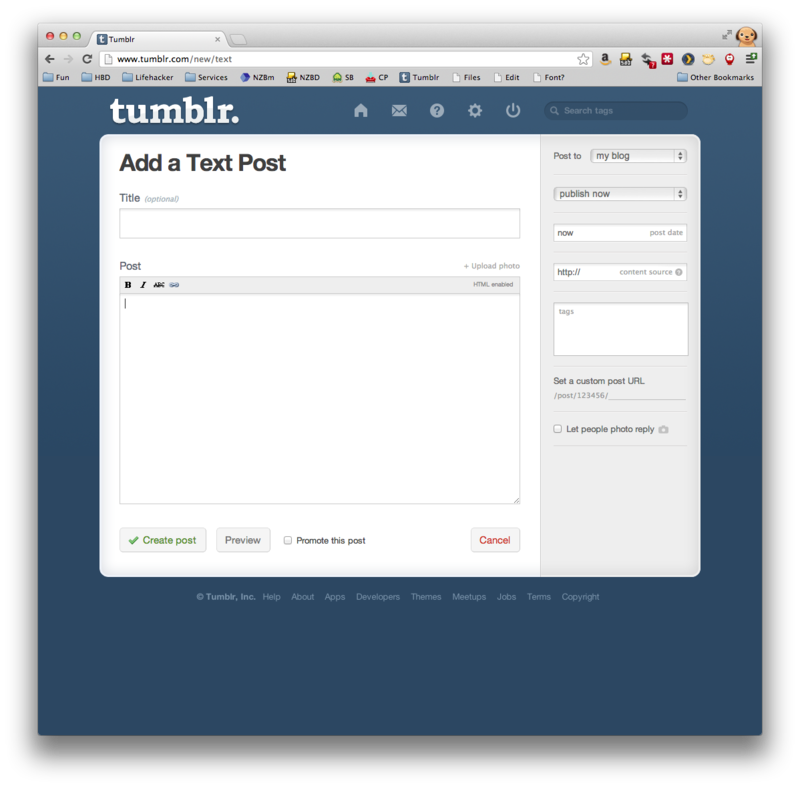 When using Tumblr, you're creating a blog-oriented site. If you want something else, it simply isn't the service for you. Additionally, Tumblr's encountered serious security and downtime issues in the past. While few popular services can say they haven't, it's something to bear in mind. If you want to create a simple blog or blog-oriented site, pay nothing, and benefit from Tumblr's online community, it's a great choice. If you want more flexibility, however, most anything else will suit you better. When you want to make a web site to your exact standards, you have to code from scratch. Obviously this means you need toknow the basics of programming and how to make a web site, plus some design skills. If you can pull all of that off, and you've got some time on your hands, nothing offers more control than making a site from scratch. You can do anything you want. You can host the site anywhere you want. What you can accomplish is only limited by your ability to learn. No option takes more work than coding from scratch. Even if you use a framework like Ruby on Rails or Zend to help you code faster, the workload is very high. Building a web site from scratch offers a lot of control, costs nothing (aside from paying for aweb host), and requires a lot of time. If you're just building a small site, it's a great option. If you can create a site that fits in with the way other software and services work, you'll likely accomplish your goals faster (and possibly better). Of course, the options above do not represent every single tool that's available but rather the ones we feel are both excellent choices and popular options in their respective categories. If you're looking for alternatives to the services mentioned above, however, here are some options for each. If there are any you like that weren't mentioned in this list, please share them (and why you like them) in the discussions below. The service you choose will come down to your particular needs and the needs of the site you're creating. Even if you really like one of the services we compared here, remember that the next site you create may work better with a different tool. Consider the pros and cons of each and how it applies to your next project and you should have no trouble ending up with the wonderful web site you hoped for. Photos by Tatiana Popove (Shutterstock) and Jason Winter.